Bethesda houses three separate gathering spaces of varying capacity. The Sanctuary, pictured at left, is our main worship space. It is a traditional church auditorium, consisting of a chancel rostrum area at the front, with altar, pulpit, and lectern flanked on one side by an organ/piano loft, and a choir loft on the other. Antique memorial windows and wooden wall paneling evoke a sense of dignity and stateliness that compliment a traditional church wedding or worship service. This space can seat about 175 people. Our building also features a secondary worship space: the Chapel. 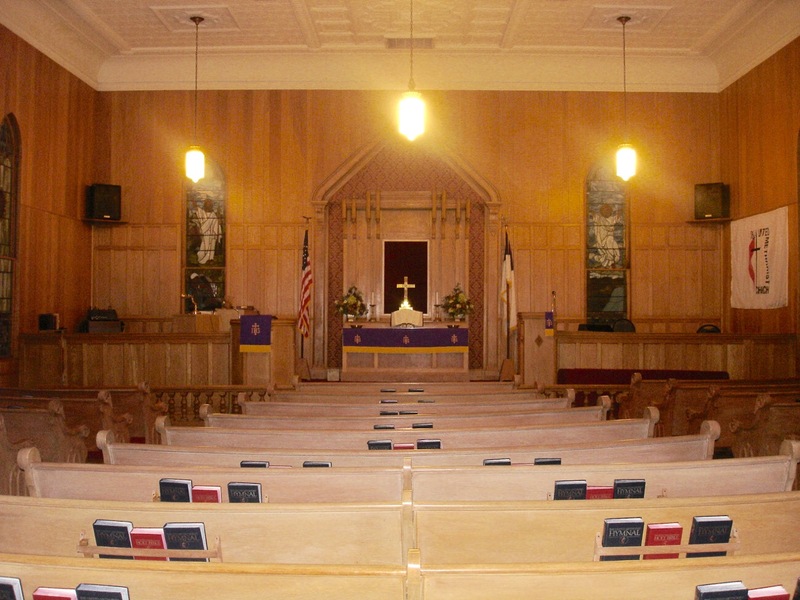 With seating for about 50 people, the Chapel offers a more intimate environmnt for worship, and is a great venue for small weddings and memorials, as well as secular gatherings such as presentations. It features a simpler pulpit, lectern, and altar arrangement than in the Sanctuary, and an array of stained glass windows that create a bright, inviting atmosphere for any occasion. Our Fellowship Hall is the congregation’s main gathering space for receptions and other church functions. It can house about 150 people, and is equipped with tables and seating for banquets. A kitchen is adjacent. At one end of the room there is a small stage that is the perfect space for a head table, or for a performance. Unfortunately, the Fellowship Hall is not, at present, handicap accessible.